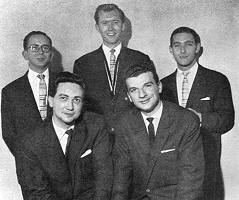 Ronnie Ross and Allan Ganley formed The Jazz Makers in 1958 with Art Ellefson (tenor sax), Stan Jones (piano) and Stan Wasser (bass). The Jazz Makers were a huge live attraction using clever arrangements and a straight ahead swinging style. They came second in the Melody Makers readers poll in the small combo section in 1959 beating even the Jazz Couriers. In 1959 the group toured the USA as part of a package that featured, amongst others, Thelonius Monk and George Shearing. While there they were recorded in New York by Nesuhi Ertegun, co owner of Atlantic Records, who was particularly taken with the baritone sax playing of Ronnie Ross. Atlantic Records were a pioneering label when it came to modern jazz and the release of the album caused a sensation amongst followers of the band. This was the only album the group ever recorded and it was released in the UK on the Ember label. During the visit Ronnie received a Downbeat magazine New Star award. The Jazz Makers continued to work prestigious dates touring with The Modern Jazz Quartet and performing at the Newport Jazz Festival in 1959. The group finally disbanded in 1960. It is easy to see why the group was successful, they had honed their arrangements during their time on the road, Ross and Art Ellefson were fluent, melodic soloists and Allan Ganley's crisp drumming was an inspiration. Art Ellefson (ts), Ronnie Ross (as,bs), Stan Jones (p), Stan Wasser (b), Allan Ganley (d). Two Hoots/The Real Funky Blues*^/It's A Big Wide Wonderful World*^/How Long Has This Been Going On*^/Pitiful Pearl*^/Blues For The Five Of Us*^/The Country Squire*^/I Won't Fret If I Don't Get The Blues Anymore*^/The Moonbather*^/Suddenly It's Spring/Blues For June (unissued)/Cherry (unissued).